So, yes, #Muse15 was a fantastic learning, networking, and confidence-building experience. Here’s my report on Friday’s events, from the general conference details, to the presentations I attended, to lessons learned and tips for attending future conferences. Like with past editions, #Muse15 was held at the Park Plaza Hotel in downtown Boston. It’s within walking distance from South Station and Back Bay Station as well as a number of bus and subway stations, so it’s easy to get to if (like me) you live outside the city and have access to public transportation. You can also drive into Boston and park in the recommended lots mentioned here. One of the big draws to get to #Muse15 as early as possible was a complimentary hot breakfast served in Park Plaza’s Imperial Ballroom. Scrambled eggs, bacon, sausage, pastries, muffins, fruit, yogurt, hot and cold beverages – yum! (I don’t know about you, but I NEVER pass up free food. *wink*) Several rows of tables were set up as well, so attendees could sit down and socialize for over an hour before the organizers (members of the Boston creative writing non-for-profit Grub Street) gave some quick speeches to officially kick off the day’s events. When I checked in for #Muse15, I was given a “booklet badge” containing a map of Park Plaza’s meeting rooms and a general conference schedule, as well as a welcome packet. 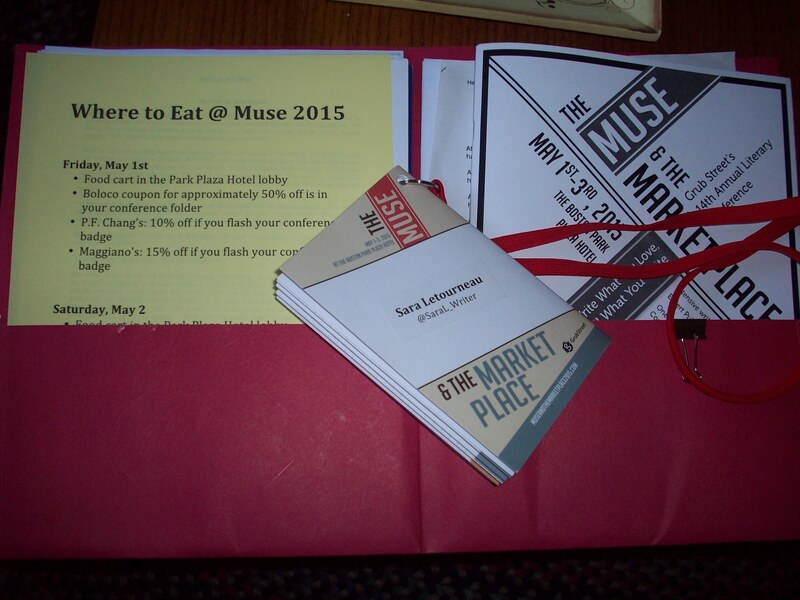 The packet was actually a folder of printed information that included my personal #Muse15 schedule, a conference program with session descriptions and presenter bios, and coupons and other #Muse15 discounts for local restaurants and Grub Street’s summer classes. This folder came in handy as the day went along, as it gave me a place to carry handouts from the four sessions I attended. Getting around Park Plaza itself was easy – once I knew where I were going. The conference’s various sessions were held in meeting rooms on two separate floors (one right above the other), with stair and elevator access to both floors and about 15 minutes between each round of sessions. So, I never felt the need to hurry to get from Point A to Point B. But since there weren’t many signs that showed which conference rooms were in which direction, I definitely needed the map that was provided in my badge booklet to find my way around. Of course, a literary conference has to have books! The waiting area outside the Imperial, Plaza, and Statler Ballrooms had a few tables full of books from this year’s presenters as well as self-published titles, including those participating in the Authors In The House contest (see the list below for a link). There were also tables for literary magazines, colleges and universities offering MFA programs, and writing organizations – all of them local to the Boston area or the New England region. Attendees who have Grub Street memberships save $25 on general admission. Additional fees are required for Manuscript Mart and Shop Talk Lunch. Unlike breakfast, lunch is not complimentary. However, the welcome packet included a flyer that listed lunch options for attendees, including food carts in the Park Plaza lobby (I don’t remember seeing any, though…) and select restaurants within walking distance that offered special #Muse15 discounts that weekend. All three days of #Muse15 were packed with break-out sessions covering everything from the craft of writing and specific genres, to working with agents and editors, to the ever-evolving publishing industry. Seating was limited to 50 attendees each, so I signed up for the events I wanted as soon as I registered for the conference. Here are the four sessions I went to that day. This workshop gave writers the opportunity to receive feedback on the first two pages of their YA manuscript. Attendees needed to submit their pages by an established deadline so Bil could read each entry and organizers could make copies for each “student.” During the workshop itself, each writer would read their two pages out loud, while colleagues would read along and then give constructive feedback on the pages. Bil would also offer his comments during this time. In theory, “First Pages” was a great idea, but the session itself was disorganized. It took a while for copies to be handed out, and after that some of us had duplicates or were missing a writer’s pages entirely. However, the feedback that writers received seemed to give them a general boost of confidence while helping them steer their first pages in the right direction. I didn’t submit the first two pages of The Keeper’s Curse (still in revision mode! ), so I can’t say the story benefited from the workshop. But I learned a lot via observation, including the importance of establishing your protagonist’s voice and being careful with the amount of detail and backstory used early on. Favorite Tip From This Session: If you’re writing a YA novel of any kind, make sure you have a clear idea of your protagonist’s age and the one thing they want most (i.e., the desire or goal that’s driving the story). Are you an adult who enjoys reading YA literature? (*raises her hand*) You’re not alone. According to this Publishers Weekly article, about 55% of YA books are bought by consumers / readers who are age 18 or older, with 28% between the ages of 30 and 44 – and of that number, 78% are purchasing the books for themselves. What does this shift in readership mean for YA writers? How are agents and publishers responding to these demographics? Which YA novels bridge the “age gap” more than others do? 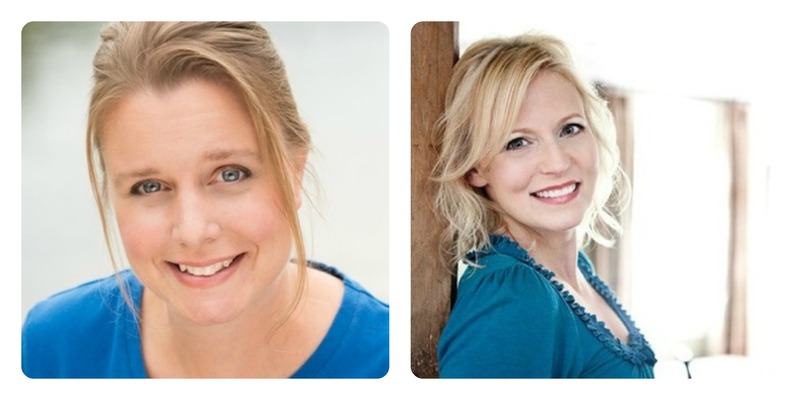 Jen Brooks and Kim Savage – who are YA authors themselves – explored all of these questions by examining trends in content, reading passages from their favorite “cross-over” YA novels, and discussing the opportunities writers may have when they’re writing such stories. I am SO happy I went to this session!!! “Blurred Lines” was my favorite event of the day because a) I’m an adult reader who enjoys both adult and YA literature, and b) I consider The Keeper’s Curse to be upper-end YA due to my protagonist’s age (17 going on 18) and its content. More importantly, Jen and Kim aced their presentation with flying colors. The passages they read from select YA novels were great choices for the topic, and their handouts included names of agents and publishers seeking YA lit with cross-over potential. (Ka-CHING!) Plus, both ladies were super-friendly, knowledgeable about the presentation subject and other examples of upper-end YA, and happy to stay a few extra minutes to answer our questions. Favorite Tip From This Session: Um, everything?? 🙂 After the session, I asked Jen if she thought it’s worth mentioning in query letters that a YA manuscript may have cross-over potential with adult audiences. Jen’s answer? If you’re querying the agents listed on their hand-out, absolutely! If you’re querying other agents, however, you should be more strategic depending on the agent’s genre preferences and wishlist. Writers now have more options than ever when it comes to publishing their work. The question is, which option is right for us? What factors should we consider as we’re making this decision? April Eberhardt, a Literary Change Agent and author advocate, discussed all this and more during Fifty Shades of Publishing. She addressed the current state of the publishing industry, then presented a half-dozen different publishing methods from the most popular choices (traditional, self-publishing) to more innovative avenues that are gaining traction (partner publishing, assisted publishing). Partner publishing in particular grabbed my interest. I hadn’t heard of it before #Muse15, but the idea of a company essentially helping you to “self-publish” your book and in some cases using crowd-funding to help pay for publication costs really intrigued me. I’m not sure yet if that’s the route I’d consider for myself, but it’s worth considering. April’s approach during Fifty Shades was informative and frank. She listed pros and cons for each publishing method and described the lesser-known routes for those of us who had never heard of them before. Sometimes I thought her tone hinted at bias toward certain options, but she constantly reminded us that this is our individual decision in the end, and that we should always consider how much time, energy, and money we’re willing to spend to reach our dream of being published. Favorite Tip From This Session: Regardless of your publishing choice, be prepared to carry the bulk of the marketing load. Most traditional publishers and small presses don’t spend as much money on promotion as they used to – and unless you hire a promo team to do the work for you, you won’t have that kind of help when pursuing other routes, either. When writing a scene for our stories, we often have to choose between showing the scene in full (dialogue, action / reaction, description, etc.) or summarizing it concisely. The trick is figuring out when each approach is most appropriate, and maintaining that balance between dramatizing and summarizing throughout the story. 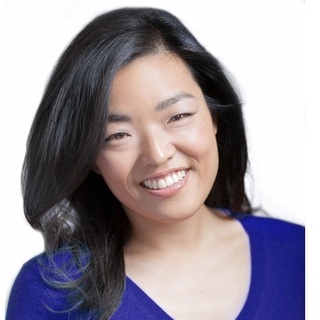 Debut author Patricia Park covered the pros and cons of each method, and presented examples of successful scenes, summaries, and balances of both from Ernest Hemingway (“Hills Like White Elephants”), Jhumpa Lahiri (The Namesake), and Claire Messud (The Emperor’s Children). Patricia’s presentation turned out to be excellent. She gave clear examples and explanations of dramatizing and summarizing, was enthusiastic and well spoken, and got the audience involved by having volunteers read the examples out loud. Plus, the angle she offered on the “show, don’t tell” dilemma was unique and made perfect sense. We’ve heard about using details to avoid adverbs, expand on a character’s thoughts or memories, and draw readers deeper into the story. However, when looking at the big picture, we need to be careful about how much detail to use – and when it might not be necessary. Patricia also gave us “homework assignments” – exercises and questions to ponder regarding our work and dramatizing vs summarizing. I plan to look over those exercises as I revise The Keeper’s Curse, to see if there are summarized scenes that should be written out in full or vice versa. Favorite Tip From This Session: Dramatizing a scene can slow down a story’s pace if the main action is mundane, like (as Patricia chose for an example) making a peanut butter sandwich. Unless that mundane action is central to the story, it might be better off as a side detail – or as part of a summarized scene. Finding a conference buddy. Originally I was planning to go alone. But thanks to DIY MFA’s Facebook group, I “met” another local writer who was going to #Muse15 and made plans to meet with her and one of her writing pals during breakfast. The three of us also ate lunch together later on – and by coincidence, they each had signed up for one of the presentations I wanted to attend! The day wound up being so much more enjoyable as a result, and that joy convinced me to use social media to find other writers who will be at other conferences I plan to attend in the future. Practicing my pitch for The Keeper’s Curse. Even though I’m nowhere near ready to pitch TKC to agents yet, I followed a previous Muse attendee’s advice and drafted two pitches for #Muse15. Good thing I did. Other writers asked what my novel was about, giving me an opportunity to practice, and vice versa. Now I know what works and what doesn’t, and can tweak my pitches accordingly. Staying relaxed. I often get nervous before events like #Muse15, especially if I’m going someplace for the first time and don’t know anyone. So, I paced myself by arriving early for my trains and remembering to breathe when practicing my story pitch. That, along with Item #1 above, helped me remain calmer and more collected – and a teensy less shy – than I would have been otherwise. Bring business cards. I had planned to bring my “author contact” cards to #Muse15 – but I didn’t realize until they’re seriously out of date, so I didn’t. I probably would have been embarrassed if I did, but the lack of said cards made it difficult to exchange contact and social media details with other attendees. Updating my contact cards is now one of my priorities for the summer, perhaps as early as after the website updates. Continue practicing my pitch. I already hinted at this in the previous section. Not only does the pitch need honing for clarity and concision, but I also need to practice more for confidence’s sake. I wouldn’t say I stammered or blubbered the verbal delivery, but I want to sound more sure of myself next time. Leave ample time to research presenters and other scheduled attendees in advance. This is one of the most common bits of advice you’ll find regarding literary conferences, but it bears repeating. I didn’t remember to look up any authors, agents, editors, and other folks of interest to me until three days before the conference. Next time, I’ll start double-checking a week or two earlier – especially if I’m planning to go for more than one day. Did you attend The Muse & The Marketplace 2015? What other literary conferences or events have you attended in the past, or are planning to attend this year? Got other conference tips that aren’t listed above? Feel free to share them in the Comments section below. Sounds like a really enjoyable, valuable event, Sara. And – to my eternal shame – I’ve attended a bunch of conferences here in the UK and I’ve NEVER considered practising my novel pitch, or had any business cards to hand out. 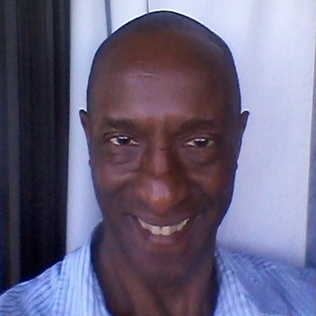 I found this a very informative account – many thanks! Thanks, Sarah! Yes, it was a great experience, and a lot of fun too. Yeah, a LOT of writers were exchanging business cards at the event. It made me feel a little ashamed for not bringing mine, even though they were out-of-date. Something to file under “You learn something new every day,” right? It really is, Tammy! And going only for one day was a great way to get back into the “literary conference swing.” But now that the bug’s bitten again, I can’t wait for the next one! Great post! You got some wonderful YA tips. And it sounds like you had a blast. Sounds like a wonderful time and learning experience! I’m glad you were able to meet up with other writer friends who were going. Staying relaxed, important tips there (I get nervous in new places, and of asking questions when in a class). Business cards, yes, *sigh* I need to do that too! What advice did you learn about writing a great pitch or book blurb? You mentioned partner publishing, do you have a few names of partner publishers to look into? I’m curious how much they help in the publishing process, and whether it offers more success than self publishing does. Yes yes yes! And I think my excitement for the day helped trump my nerves as well. When you’re in your element (so to speak), it gives you a kind of courage you might not experience in other situations. I’ve actually gotten conflicting advice about pitches. Some blogs / agents say it’s one sentence. Others say it’s 3 to 4 sentences – a short paragraph, in other words. That was all advice I read in advance of Muse, though. So I ended up drafting both types of pitches before the conference. BookTrope was the partner publishing company whose approach stood out to me the most. April mentioned several others: SheWrites Press, Wise Ink, Inkshares, Turning Stone, White Cloud, SheBooks, Greenleaf, Etruscan… (Thank goodness for taking notes! *lol*) They each have different policies, financial structures, etc. (Not all of them do crowdfunding, too -which I should have mentioned in the article. Sorry about that.) So if partner publishing interests you, make sure you check out how they’re different from each other. For a pitch, yeah, a short paragraph makes more sense to me, and with the first sentence designed to draw people in. That reminds me of book blurbs–I need to come up with a good one. I have rough drafts but nothing great yet XD. Blurbs really are buggers to write, aren’t they? *lol* I threw one together for TKC for the Novels page, but it needs a lot of trimming. I’m still thinking traditional publishing for the first route. I don’t know why, but my gut feeling keeps going back to it… But I would be open to other options if that route doesn’t work out, and partner publishing *might* be it. We’ll see. Wow! It sounds like you had a lot of fun! I’ve attended the Florida Christian Writers Conference for six year, but now I’m branching out to other conferences. In August, I’m attending one called Realm Makers which is for spec fic writers. ^ ^ A tip I’d say is bring a backpack. At conferences you’re often given a ton of handouts or you purchase books or you want to bring your laptop for notes and it’s hard to carry it all. A backpack is a great place to keep it all and keep your hands free. And stay caffeinated. XD I bring my own teabags and a thermos. Ooooh, where is Realm Makers being held? I’ve never heard of that one before. Oh yeah. Hydration is important. I have almost dehydrated at conventions lol.